We created a striking international exhibition design that contributed to Galaxy’s success in Europe. International exhibition design can be an daunting prospect. Parker Design however are very experienced at not only creating fabulous looking exhibition designs, but also in the organisation and logistics required to look after international exhibitions. As we demonstrated with this 84sqm exhibition stand in Milan. Parker Design had previously designed and built a 60sqm exhibition stand for Galaxy optical Services for a show in Paris. Following the success of that show, Galaxy approached Parker Design to create a larger international exhibition design for their Milan show. 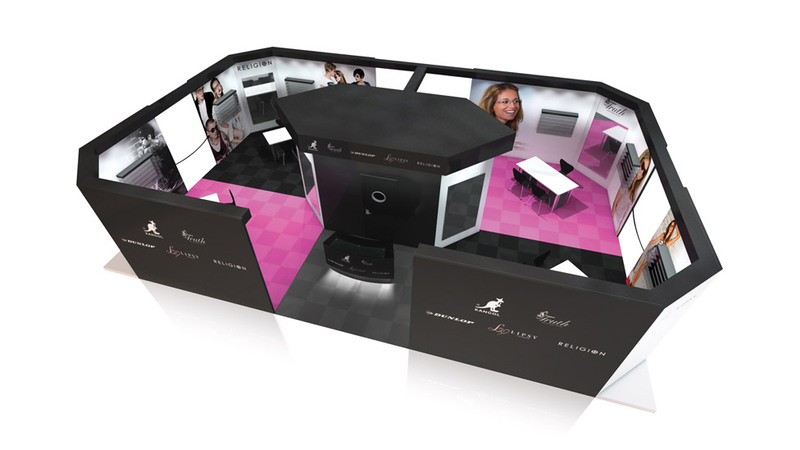 The stand design followed the theme we set with the Paris stand, using the same colour scheme and a similar layout. We increased the size of the stand to allow Galaxy to showcase the latest addition to their brand eyewear – Dunlop. The stand design featured striking floor to ceiling fashion photography, zoned areas for each of the brands being showcased, a central secure store area which also housed an integrated PA system with concealed audio speakers and WiFi connection. We also designed and built wall mounted lockable showcases with integral spotlights in which to display Galaxy’s eyewear ranges. Parker Design provided a full turnkey solution, from the initial design of the stand, through to dealing with the show’s Italian organisers, right through to the transportation, build, breakdown and repatriation of the stand following the show. We are an experiential agency that loves to create unique brand experiences. To help our client grab a piece of the lucrative healthy food market, we unveiled their new organic chickpea snacks – HIPPEAS – with a ‘totally groovy’ experiential roadshow design for their launch event. We have been Sage's experiential agency of choice for many years. This time, we made them the talk of the show with a striking double decker exhibition design that significantly boosted their social media mentions, and resulted in nearly 400 qualified sales leads. When CRJ Services took the decision to trial exhibition design for the first time at their industry show, RWM (Recycling and Waste Management) at Birmingham's NEC, they called on our experience.